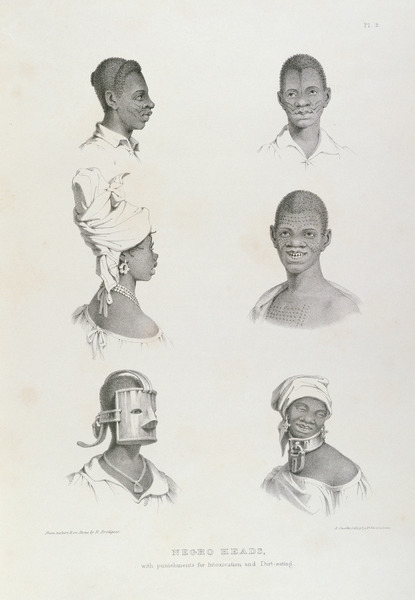 In a PDH blog post earlier this year, the Dutch historian Paul van Trigt asked whether the investigation of historical violence against people with disabilities can ever serve the emancipation of people with disabilities? I believe that it can, and to illustrate this, I am going to look at the various ways in which the disability rights movement in the United Kingdom has dealt with Nazi attitudes towards, and treatment of, disabled people, and the questions which this continues to pose for contemporary Western societies. As this is a rather large topic, I am going to address it in two blog posts. In this first post, I am going to discuss the various instances of images connected with this being used to cement a sense of group identity amongst disabled people. In my subsequent post, I will be looking more closely at the programme’s wider implications, and discuss how members of the British disability rights movement have engaged with these. I hope that my two posts will provide a comprehensive answer to van Trigt’s question. Early UK texts on the subject of what would become Disability Studies did not include references to Nazi attitudes towards disabled people. An example of this is the 1966 book Stigma: The Experience of Disability, edited by Paul Hunt. The book showed disability as the collective experience of oppression, rather than as the individual experience of bodily deficit, and it contains two references to Nazism, but neither of these is connected to the Nazi ‘euthanasia’ programme, suggesting that at this stage it had not entered into disabled people’s collective consciousness – at least not in the United Kingdom. Allan Sutherland’s comment is an important one, because it links Disabled We Stand to both the concerns expressed in earlier disability studies texts, and also with the reasons why the Social Model of Disability – which has become the cornerstone of the British disability movement – was developed. I also argue that it explains Sutherland’s decision to refer to the Nazi ‘euthanasia’ programme – if it could be shown that disabled people had been subjected to a programme of systematic state murder, the traditional view that they were suffering from their impairments with (almost by definition) no societal problems in sight, became increasingly untenable. UK Disability History Month (UKDHM) also refers to Nazi attitudes towards disabled people in order to increase feelings of group cohesion and legitimacy. As shown in the illustration, the UKDHM logo is a black triangle with a yellow circle in the middle. Inside this circle, ‘UK DISABILITY HISTORY MONTH’ is written in black letters. The logo also bears the tagline ‘CELEBRATING OUR LIVES – CHALLENGING DISABLISM – ACHIEVING EQUALITY’. Disabled people were forced to wear this symbol by the Nazis during the T4 Eugenics Programme which was intended to eliminate them. Between 250,000 – 1,000,000 were murdered by the Nazis’ false hopes of building a master race. The UKDHM Logo has taken this symbol, and in reclaiming our history we have inverted it. Though this statement raises questions - for example, it makes it appear that the black triangle was specifically associated with disabled people in the same way that the yellow star was specifically associated with Jews, when in fact this is not entirely true5 – it is an important development. The juxtaposition of the inverted Nazi symbol and the confident tagline asserting disabled people’s right to live and be part of society are very striking, as is the assertion that the decision to invert the triangle is an act of reclamation, in the same way that gay rights activists have reclaimed the word ‘queer’. The reference to ‘our history’ makes it clear that disabled people are seen as a specific group, with a specific identity and history. The Black Triangle Campaign in Defence of Disability Rights was founded as a response to the death of the Scottish writer Paul Reekie in July 2010. Reekie took his own life at the age of 48 after receiving a letter informing him that his disability benefits were to be stopped. Reekie’s death was not an isolated incident, but just one of many resulting from the current Conservative government’s overhaul of the benefits system. As will be discussed more fully in the next post, the Campaign uses the Nazi symbol because it wishes to draw specific parallels between the Nazis’ use of the symbol to denote people considered ‘Workshy’, and the current Conservative government and right-wing press’s characterisation of benefit claimants as ‘scroungers’. Thus, although Black Triangle and UKDHM have very similar logos, they use them for strikingly different reasons. The Nazis forced people with mental and other disabilities to wear black triangles in the extermination camps during the Holocaust. 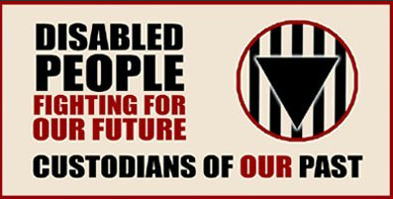 As in the case of the UKDHM logo, the Black Triangle Campaign makes it appear that the black triangle was specifically associated with disabled people, and makes similar claims regarding the symbol’s reclamation. 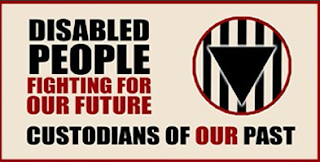 As shown in the illustration, the Campaign’s tagline reads ‘DISABLED PEOPLE FIGHTING FOR OUR FUTURE – CUSTODIANS OF OUR PAST’, and, significantly, the ‘OUR’ of ‘OUR PAST’ is in red, whereas the rest of the sentence is in black. In a similar way to the inversion of the black triangle on the UK Disability History Month logo, this emphasis on ‘OUR’ history may be regarded as an act of reclamation. This was the first part of Burdett’s response to Paul Van trigt’s earlier post. The second part of her reaction will follow soon. Dr Emmeline Burdett (emmelineburdett@gmail.com) is an independent researcher. I would like to thank Pieter Verstraete for his comments on a previous version of this post. Allan Sutherland, Disabled We Stand (London: Souvenir Press (Educational and Academic) Ltd., 1981, no page number). Allan Sutherland, ‘Coming Out Disabled’, talk given at the Approaches to Disability conference held at the University of Durham, Friday, 8 March 1982. UPIAS, Fundamental Principles of Disability, quoted in Cameron, (ed.) Disability Studies: A Student’s Guide (London: Sage, 2014, 137). The black triangle was used by the Nazis to denote concentration camp inmates considered Asocial and ‘Arbeitsscheu’ (‘workshy’). Thus, though this category included disabled and mentally ill concentration camp prisoners, it was not specifically associated with them. Emmeline Burdett (2018): Reclaiming our History? The British Disability Movement and the Nazi ‘Euthanasia’ Programme, Part I. In: Public Disability History 3 (2018) 14.